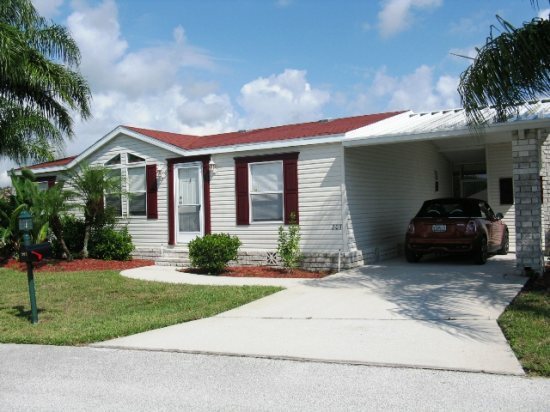 This beautiful, cottage style modular home is conveniently situated on HWY 27, about 20 minutes to DIsney and very close to shopping and restaurants. Located in a modular home community with a community pool, spa, clubhouse, tennis courts, playground and gazebo, this home is perfect for your family vacation. The house features parking for 2 cars, and has 3 bedrooms and 2 bathrooms. The main living area is open and bright, and has a cozy living room with lots of seating. 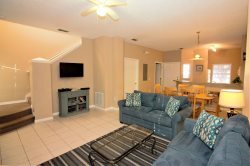 The living room has cable tv, free wifi, and comfortable furniture, for you to relax in after a long day at the parks. The galley kitchen is open to the dining room and the breakfast nook, and is fully equipped with everything you need to make and serve a great meal. A full size washer and dryer are located off the kitchen, by the back door. The back door leads out to a screened lanai with plenty of furniture. The master bedroom has a queen sized bed and a tv. A full bathroom, including a separate shower, a soaker tub, 2 sinks, is attached to the master bedroom. The second bedroom has a queen size bed. The last bedroom has 2 twins beds. There is another 3 piece bathroom as well. The neighborhood is peaceful, quiet and safe, as well, there is a local management company just a phone call away in the event of an emergency. Darren was always quick to answer questions. He's very helpful.